Is it possible to remember where one was when hearing a song for the first time after nearly 43 years? In some cases the answer is yes. Where 'Magic Man' is concerned I would say at the place of my aunt and uncle in Rotterdam while staying there. I am not sure though, where with 'More Than A Feeling' by Boston I am 100% sure, which is from about the same time. 'Magic Man' that sonic adventure, with the two pretty women fronting the band, made, an impression on an adolescent, like 'Crazy' did soon afterwards. 1977 brought 'Barracuda' and the album 'Little Queen'. A few nice albums followed with a live album that introduced me to the Led Zeppelin rock song of the Led Zeppelin rock songs: 'Rock And Roll'. When in the mid 80s and early 90s Heart moved into AOR ballads my time with the band was over and I moved on. The impression that that first album made, with the juncture between folk and rock music in indelible. In the Seattle music museum, in that futuristic building in 2003 I saw one of Ann Wilson's dresses hang and thought back to those great songs that I hadn't played for years at the time. Somewhere along the line I remember an MTV unplugged show with Nancy Wilson breaking a string on her guitar in 'Barracuda'. Every once a while on the radio the sparks still fly though. Come the last days of 2018 and a new album by Heart is dropped in my mailbox. Is it something I am waiting for? Of course not. Does it add to what has gone before? Neither, except that on most songs the band invites guests on stage even to such a level that Alice in Chains plays two whole songs of its own with Ann Wilson on background vocals in 'Rooster'. 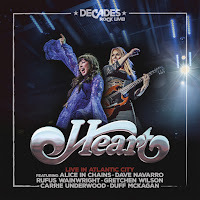 Listening to Live In Atlantic City of course that spark called Heart touches me once again. The band's best songs come by, all the early hitsingles, so who could not to be touched? "Welcome to our living room", Ann Wilson announces the show and off goes the band. 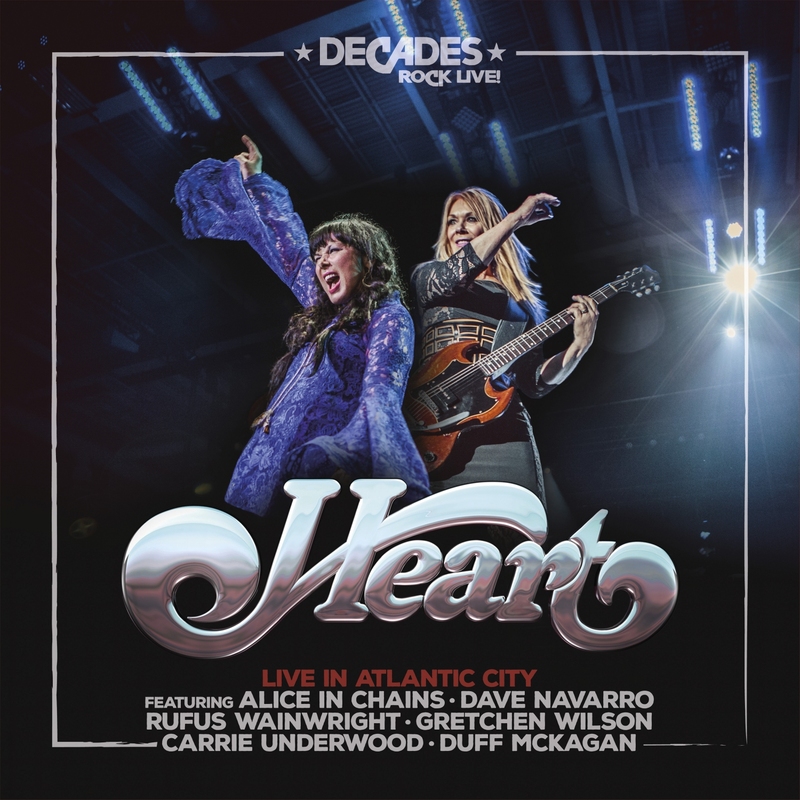 Whoever plays in Heart nowadays, the band delivers. Nowadays? In 2018 the band is on hiatus for two years after Ann's husband was arrested after assaulting Nancy's then 16 year old twins, with the sisters no longer on speaking terms ever since and both playing in other bands. So what am I listening to then? It turns out this album contains the recording of a special live show from 2006, where the two sisters invited other musicians and friends to come and play with them. Two Led Zeppelin standards come by, as said two Alice in Chains classics and many-a Heart song. Most spanning from the first two years when the band mixed it folk and hard rock roots, not unlike Led Zeppelin did, and 'Alone' as sole survivor of the AOR period, reminding me why I did not really like it at the time. And still do not really. Time softens my ears often, but not really here. 'Alone' is too tame for me, after what had come before. I do not really care for the 80s musically in many ways. The "earsoftening" usually happens with songs by artists I never liked, but some sort of nostalgia comes in when hearing the songs decades later. So, summing up. A nice live album by a band I once liked a lot. Heart was new and fresh, different to my adolescent experience. In 2006 and released 13 years later, it is a rehash of what once was. Certainly one in great shape and full of fire. So a worthy release to fill up the hiatus and an interesting one thanks to all the collaborations. When all is said and done, if I ever play a Heart album again, it will be my old albums though. Ladies Wilson, its time to patch up and continue where you were before the incident. You've lived through all other storms for so many years. So wheather this one as well.